Including a cover of The Rolling Stones' "(I Can't Get No) Satisfaction"
Before their hit song “Whip It” cemented them as new wave’s coolest one-hit wonders, Devo were a group of four Ohians—two pairs of brothers—just trying to make their name as a punk rock band. And while “Whip It” is truly a revved-up diamond of a hit, Devo are responsible for much more music beyond the song that brought them mainstream fame—and a forever association with energy dome hats. Devo released their debut album, Q: Are We Not Men? A: We Are Devo!, in August of 1978, one of our favorite albums of that year. A few months later, the scrappy art-punks were touring behind the record, and on this day (Jan. 22) in 1979, they were in their hometown of Cincinnati, Ohio. There, they played a handful of songs from the record, including a bold cover of The Rolling Stones’ ”(I Can’t Get No) Satisfaction.” That’s quite a lofty goal to tackle on one’s first album, but the post-punk, midwestern up-and-comers seemingly pull it off, even securing Mick Jagger’s approval. In these recordings, Devo also treat their hometown crowd to “Uncontrollable Urge” and “Mongoloid,” two jittery rock rips from Q: Are We Not Men? A: We Are Devo!. 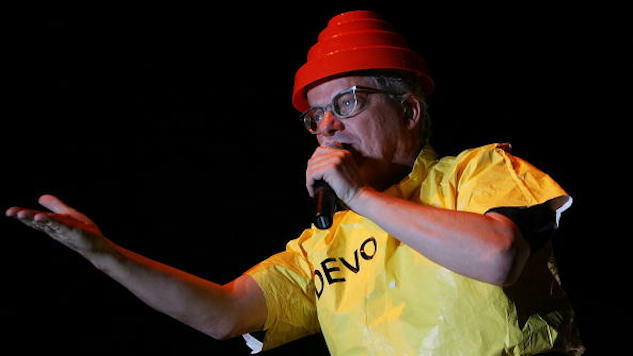 You can listen to Devo’s 1979 concert below via the Paste vault. Further down, watch a 1984 interview with the band. While you’re here, read our list of the 30 Best Albums of 1978.